Good Clean Gnarly? Not really, but the crew from Get Gnarly definitively have an idea on how to have a fun life. Tron has created a crew and brand that is all Ocean City,a party on 4 urethane wheels. With the simple banding of the phrase “Get Gnarly” and some solid skating in well produced videos, Tron built a brand that is prevalent in all the skate shops in town and beyond. In the past year Get Gnarly added “Thug Mansion” to its growing legacy. This warehouse space with its LED lit miniramp, laser light show and Jacuzzi has become the hot spot for late night partying and shredding. One case in point the weekend of the Dew Tour, the after-after party was there and saw proskaters, OC Old School skaters, and the young (some real young) guard tearing up a beer soaked ramp in a skake session. Most were just eatin it but others would get a great line and kill it including a couple of the Thug Mansion VIPs ( they have there own section with velvet ropes and everything) The trailer for a new Get Gnaly video was put out this week and looks to have upped the ante with this one. I must say that as a pseudo-responsible adult, and guardian of a 17 year old, I would be scared to allow anyone under age to go any where near Thug Mansion. After all it seems to be a lawless land of debauchery, even frequented by gypsys. But as a Skater this place is awesome and some time self governing is the best government. 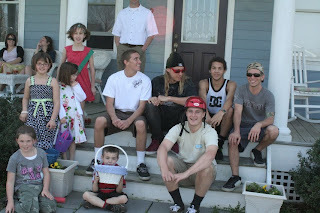 I hope the this crew, which actually came to our house for easter one year (thats another story) can keep things Gnarly, but continue to grow as a legit brand.